It’s hard to believe that it’s been nearly a year since blues-rock guitarist Joe Bonamassa has released a new album, with Live At Carnegie Hall: An Acoustic Evening still a vibrant reflection in our rear-view mirror. Still, Joe loves the stage, and at this point in a career that has spanned nearly three decades, he’s released more live albums as a solo artist (14 counting this one) than he has studio works (a dozen as of 2016)…and don’t get me started on his band efforts with Black Country Communion or collaborations with singer Beth Hart. Releasing at least an album a year, he’s as prolific as any artist currently working. Joe’s latest live set is yet another expansive two-disc collection where the guitarist lets his British blues-rock flag proudly fly. Guessing that Joe’s dad is of a similar vintage as myself (i.e. early 60s in age), we probably shared a lot of the same records – records that young Joe B. grew up listening to. Joe’s love of British blues-rock has been quite evident on his albums through the years, as he’s covered songs by a lot of his fave artists, but British Blues Explosion Live brings the guitarist’s fascination with bands like Cream, the Jeff Beck Group, John Mayall’s Bluesbreakers, and Led Zeppelin to a boiling point. 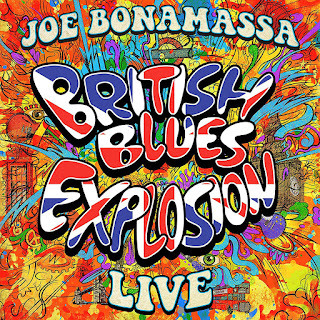 Recorded live in July 2016 at The Old Royal Naval College in Greenwich U.K. this fourteen-track collection may be the heaviest guitar album that Bonamassa has made in years. Joe’s done his homework here as well, mixing in covers of the usual suspects (Jeff Beck’s “Beck’s Bolero,” Zep’s “Boogie With Stu,” Cream’s “SWLABR”) with a few deep cuts of lesser renown. Although Eric Clapton’s reading of the traditional “Motherless Children” is a familiar favorite from his acclaimed 1974 album 461 Ocean Boulevard, his cover of songwriter George Terry’s “Mainline Florida” is obscure by any measure. Bonamassa funks the tune up with a loping groove and soulful vocals while the band recreates the original soundtrack to perfection. Willie Dixon’s classic “Let Me Love You Baby” has been recorded by everybody from Buddy Guy and Koko Taylor to Stevie Ray Vaughan, Blodwyin Pig, and Stan Webb’s Chicken Shack. I’m not sure whose version inspired young Joe, but I’m going with Savoy Brown’s, as Bonamassa’s raucous fretwork here reminds of young Kim Simmonds (tho’ Joe is a fan of Blodwyn Pig’s Mick Abrahams). The Jeff Beck Group’s “Plynth (Water Down the Drain),” from the 1969 album Beck-Ola, was a tailor-made showcase for Bonamassa’s rockin’ “Guitar God” persona, and while his hurried vocals don’t capture much of the soul innate in Rod Stewart’s original performance, his fretwork burns with the intensity of a collapsing star. The vastly influential John Mayall’s Bluesbreakers is represented by “Double Crossing Time” and “Little Girl” from their classic 1966 LP Bluesbreakers with Eric Clapton. The former is a sizzling Chicago-styled blues romp with plenty of Reese Wynans’ tinkling piano keys and Bonamassa’s fatback fretwork while the latter is a more up-tempo jaunt with stinging guitar and rollicking instrumentation. A cover of Beck’s “Spanish Boots” is simply breathtaking, Bonamassa’s voice soaring above the staggering rhythms while his guitar rages like a hurricane fiercely eyeing landfall. Bonamassa sneaks his own instrumental “Black Winter/Django” onto the set list, and it’s a testament to his British blues-rock influences that his nimble-fingered guitar playing reminds of both Beck and Jimmy Page. The guitarist’s duel with drummer Anton Fig here is particularly exhilarating, the two artists parrying and thrusting their instruments like skilled fencers gone mad. Fig’s bombastic percussion opens Zeppelin’s “How Many More Times,” Bonamassa’s vocals flowing more naturally than Plant’s original efforts, and while he’s not bowing his fretboard, he’s tearing it up like Albert King at his peak. 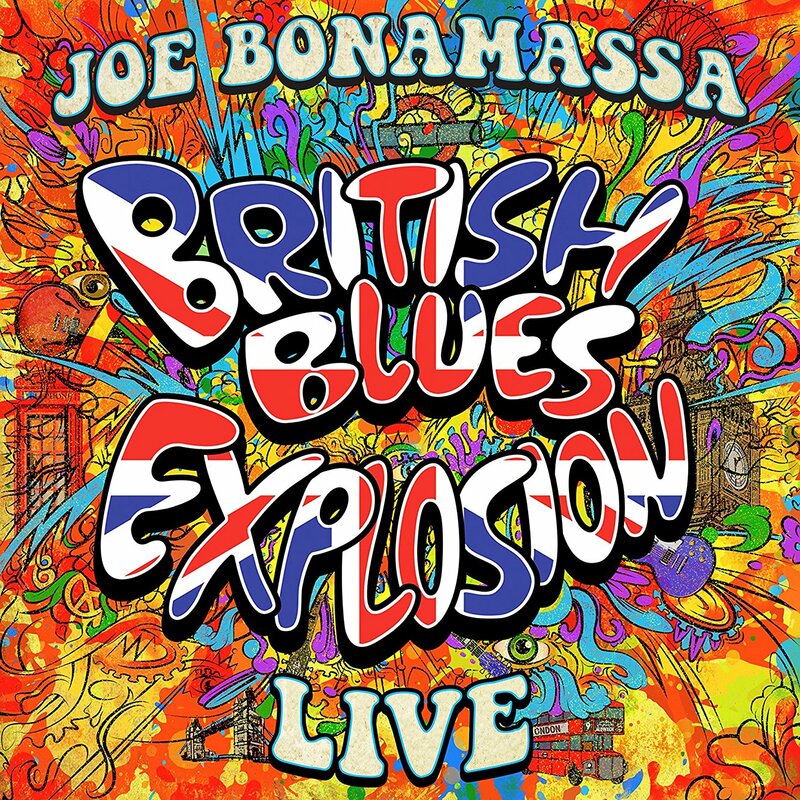 Joe Bonamassa never ceases to surprise, and British Blues Explosion Live is certainly no exception. The inspiration for these performances leaps out of the grooves with a vengeance, leaving Bonamassa’s talented veteran road band to catch up. There’s nary a wrong note to be found among these fourteen tracks, and the immense contributions here of keyboard wrangler Reese Wynans – himself a veteran of bands like Captain Beyond and Stevie Ray Vaughan’s Double Trouble – remind listeners of the role that piano-pounders like Nicky Hopkins and Ian Stewart playing on the original recordings of these songs.